I have been using Interlude for over forty years. I have to make sure I have enough until I die. It has been my "signature" most of my life. I have always loved Interlude for many years and want to know if it is still being produced and where can I purchase it instore or online. Is their a perfume that is similar? a cousin (who worked at Frances Denney's in Philadelphia) gave me a bottle of their new scent INTERLUDE in 1965...been using it ever since. I hope someone bought the formula and will continue making it. 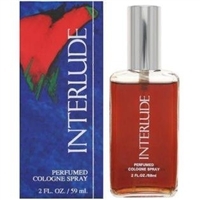 I have been trying to find a place to buy Interlude for 10-20 years.I had it when I was first married 47 years ago. One name brand store had it for awhile but it looks like online is the only place to get it now and I have out of it for years. Do put me on a wait list!